1) Try to get and maintain the outside position. From here you have numerous opportunities for attack while your opponent has very few. As long as you maintain this favorable position and press the attack the odds will be stacked about 80/20% in your favor. 2) Use movement to off-balance your opponent, disrupt his attacks, and create vulnerability as you launch your attacks. As a rule big guys hate to be moved. In judo, for example, the larger, heavier fighters most often like to stop their smaller opponents in their tracks and then explode into a big powerful throw. If they are to prevail, the smaller judo fighters must use circular body movements to create momentum and off-balance their larger opponents, and they must take advantage of the vulnerability this creates in the opponent by attacking on the move. The same tactic can be applied in self-defense situations. By using small, tight circular motions you can off-balance your opponent and make it difficult for him to counter attack. You can also use these circular motions to create momentum and set up your attacks. Let’s take a look at just a few possibilities from a grappler’s perspective once you have cleared your opponent’s arm and have achieved the outside position. 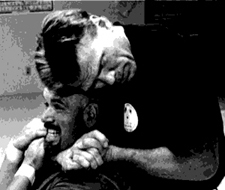 Photo 1-3: While cupping your left hand behind the opponent’s neck and checking his arm above the elbow with your right hand, throw a knee strike into his head or midsection. around and bring his head down. Reach up over his head with your right arm and execute a Guillotine Choke or a Front Face Lock. Note: Keep your circle close-in and tight. This creates more momentum and denies the opponent the space he needs to reorient his body and get back in a favorable position. Photo 8-12: You can also use this circular motion to redirect your opponent into a wall, car, pool table, or other obstacles or attackers. Once you have redirected the opponent you can follow-up with a “5 on 2,” or any number of other attacks or controls from his back. Well, there you have it. Please keep in mind that these are just a few of the available options from the outside position. Feel free to experiment and come up with your own finishes. And above all, have fun in your training! Please drop me a line and let me know how these skills work out for you. (www.johnsaylor-sja.com, email: sjahq@aol.com).